Our Prosperity Mandala Stencil is rich in DIY style. Opulence, Luxury and the Good Life are what this mandala stencil represents. And you can totally see it in this beautiful stencil pattern with its finely detailed motifs. Mandala decals don't allow you to use multiple colors. Our large mandala stencils can be custom stenciled to match your decor. 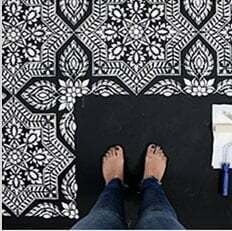 So grab this amazing stencil pattern and a stencil brush and bring some Prosperity into your home today! For the mandalas that are 18" to 30", you will be receiving a full medallion. For the 36" and 44" mandalas, you will receive half of the design and to complete the medallion, pick up the stencil after completing one side, flip it and line up the registration marks (see photo above), tape it and do it again. For the 60" and 74" mandalas, you will receive a quarter of the design. To complete the design, place a pin in the center of the design (hole provided), tape and stencil the medallion quarter. After completing one quarter, rotate the mandala over to complete the half using the registration marks. Rotate the mandala until you've completed the whole design. This medallion stencil is so easy to use, virtually anyone can do it. Simply tape it to the wall using BLUE painter's tape, then load your foam roller with the paint of your choice (latex or acrylic). Get rid of excess paint by rolling the foam roller over a folded paper towel. Then, just roll it over the stencil applying medium pressure for an instant fabulous result! Don't press on the roller too hard otherwise you might get some paint seepage under the stencil. This is an easy design to stencil with a dense foam roller. For expert stenciling tips, please watch our How-to stencil videos! You'll find them extremely helpful for your stenciling project. Even beginners get great results! Although most of our stencils do not require the use of spray adhesive, if your walls have a texture to them, it might be a good idea to use spray adhesive to help minimize paint seepage (Elmer's spray adhesive seems to be the best). Make sure you shake the can well and lightly mist (not drench) the stencil, and let it dry for a moment before positioning it on the wall. This step will prevent the adhesive residue transferring to the wall. You'll need to re-mist the stencil after a few repeats. Note: you will still need to hold the stencil in place with a few pieces of blue painters tape! Adhesive by itself is not enough to hold the stencil on the wall. Clean-up tip:Spray the stencil with Simple Green to help to remove adhesive residue and let it sit for a while before cleaning with soap and water. Please note that it is virtually impossible to get rid of all adhesive residue. That's why we personally prefer not to use it and just stick with painter's tape!